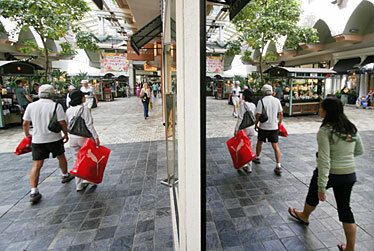 Shoppers were reflected in a storefront yesterday at Ala Moana Center on the last day of shopping before Christmas. Yesterday was a surprisingly jolly holiday for Hawaii's retailers and property managers, who reported one of the region's strongest revenue-making Christmas Eves in recent times. Yesterday was a surprisingly jolly holiday for Hawaii's retailers who spent much of the season worried about the lackluster performance of the economy. The mortgage crisis and falling housing market reportedly dragged down holiday sales in some regions this year. However, retailers around Oahu are reporting strong consumer demand, with many Hawaii residents and vacationers taking advantage of Christmas' Tuesday calendar placement, turning the last shopping opportunities before the holiday into a four-day weekend. But for many, a trip to their favorite retail center wasn't only about shopping. Checking out the decorations, watching the keiki ride the holiday trains or visit with Santa was a must for many kamaaina. Marsha Parrott-Boyle of Michigan, left, and her daughter Danielle Boyle of Warwick, England, talked about their shopping experiences at Ala Moana Center on Christmas Eve. The family was spending Christmas in the islands in honor of Parrott-Boyle's parents, who used to bring her here for the holidays. "Its' been more than 23 years since I've been back," Parrott-Boyle said. "But, I remember the holidays here with great joy." Kamaaina shoppers and vacationing tourists covered Oahu's retail landscape like snowflakes in Vermont yesterday as shopkeepers and property managers reported one of the region's strongest revenue-making Christmas Eves in recent times. Across the nation, retailers have reported a mixed bag of consumer fundamentals. However, this year, Hawaii's consumer landscape is sporting a variety of hues, such as the red Macy's shopping bag, the tell-tale aqua of a Tiffany masterpiece and the simple white of a Kmart sack. "What we have this year is the optimum shopping situation," said Ron Yoda, the general manager of the Kahala Mall. "This is the best Christmas Eve that I've seen in a long-time." While Christmas Eve is traditionally a day reserved for last minute shoppers rather than the stuff of retail legends, retailers have said that holiday traffic this year in Hawaii could go down in talk-story history. However, with Christmas Eve falling on a Monday this year, many people appear to have taken the day off, leaving them more time to join the usual throng of procrastinators, Yoda said. "I'm looking down from my office and our parking lot is 100 percent full," he said. 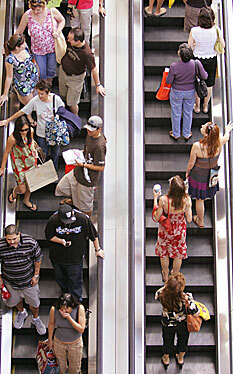 "With one hour of shopping left to go, the traffic is really heavy and its panic city for our last-minute shoppers. That's what you get with a four-day weekend." Kevin Dalere had his hands full of packages at Ala Moana Center yesterday. Though the Christmas Eve shopping traffic was heavier at Ala Moana than it has been in quite some time, it didn't deter Kevin Dalere of Kalihi from joining the holiday rush. "I'm planning to do about 60 percent of my shopping today," Dalere said as he shifted several shopping bags full of gifts. "I usually wait until the last minute because I find better sales. Many stores are offering an extra 10 percent or so off." An avid Christmas Eve shopper, Dalere pronounced this year "the busiest ever." "Everybody took today off, I think," he said. 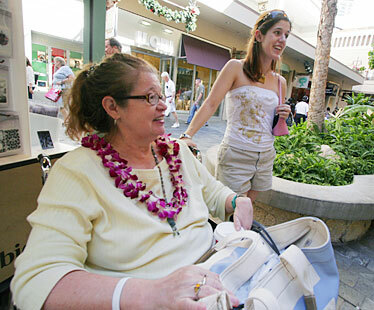 The lure of holiday shopping in Hawaii brought out tourists, too. Marsha Parrott-Boyle of Michigan and her daughter Danielle Boyle of Warwick, England, enjoyed crowd watching during a shopping break at Ala Moana yesterday. "We've already been to the beach so we got our family to drop us off here. They went to Wal-Mart," said Parrott-Boyle, who wanted to find some of Hawaii's black coral to take home with her. The family was spending Christmas in the islands in honor of Parrott-Boyle's parents, who used to take her to islands for the holidays. "Its' been more than 23 years since I've been back," Parrott-Boyle said. "But, I remember the holidays here with great joy. I even found a holiday menu from 1977." In the short while that it took Parrott-Boyle to reminisce, shoppers began crowding into parking lots and retail centers ushering in rush hour traffic early for Oahu's major roadways. Not all of the retail traffic out there yesterday was about shopping, though. People in Hawaii are big on culture and traditions and a trip to their favorite retail center to check out the decorations or bring the keiki to ride the train or visit with Santa is a must for many. Day Oshiro braved the holiday crowds to bring her 2-1/2-year-old daughter Brianne back to Ala Moana Center for her second train ride of the season. Though, Brianne is young, the train has already become an Oshiro annual tradition. "When she hears the bell, she says 'train,'" Oshiro said. "It's a tradition year after year. There's almost no avoiding it." Not that Oshiro would want to miss those moments with her little one, she said. "It's wonderful," she said. "I love to watch her clapping. She and all of the other kids are so totally into the train." With many people having the day off, malls were packed yesterday with last minute shoppers, crowding the escalators at Ala Moana Center. Lines for the Ala Moana train were so long, that little 3-year-old Lia Kato-Teale fell asleep while she waited to take her magical journey from center stage to Sears. Not even, the dancing teenage elves could wake her as she nestled in the arms of her tutu Leona Teale. "There's a lot more people out here this year than last year," Teale said. "I told her that she might as well take a little nap." The Pearlridge Center train was booked solid all day yesterday, too, said Fred Paine, the general manager at Pearlridge Center. The pace of train traffic extended to holiday sales as well with the center expecting to realize strong holiday revenues, Paine said. "We had a really strong November with double-digit increases in all categories across the board," he said. Colleagues on the Mainland have been complaining of a beleaguered season, but it's been a magical holiday for the majority of Pearlridge Center retailers, Paine said. "From what I've observed we really aren't following the mainland pattern this year," Paine said. "People here in the islands really have a generous spirit and they take this holiday very seriously. There's no doom and gloom here."